It’s a simple matter to connect the dots and see why it’s easier to fire a manager/coach than any other alternative when a team’s season goes sour, which underlies the old bromide someone inevitably cites whenever a change is made. So it’s a mild surprise whenever, say, an MLB manager’s time with the same team reaches into double figures. Longevity isn’t the key to a baseball manager notching 1000 victories with the same team, but it’s an obvious component. If he was at the helm for an average of 85 wins per season – a decent measure of mediocrity – he’d need to be in the same job for 11.8 years to achieve 1,000 triumphs. And these days, 11.8 years of mediocrity won’t cut it. Not even with the Chicago Cubs. Currently, only two MLB skippers have been with the same team for at least a decade. Logically, they’re on the list of managers who have recorded 1,000 wins with that team. It’s exclusive company. There are only ten of them in the modern-day history of the game. A 7-3 victory over the Indians in Cleveland caused champagne corks to be popped in the Twins clubhouse, as Gardenhire became the latest manager to join this exclusive group. Unfortunately for Minnesota, his milestone achievement will probably be the only time they’ll be bathed in bubbly this season. There are a number of promising prospects on the way, but the best Twins fans can hope for in 2014 is that the club avoids the AL Central cellar. Frankly, if Gardenhire manages that, he’ll have done his job. 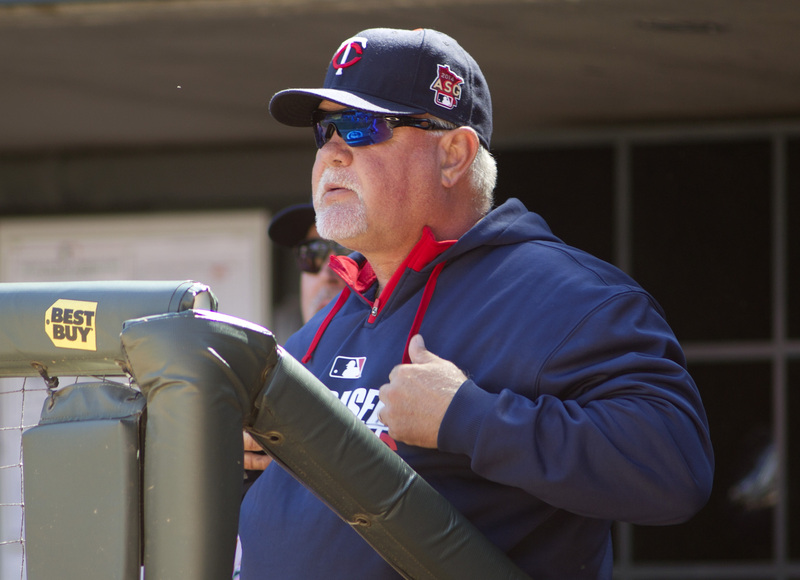 During his decade-plus, Gardenhire has kept the Twins in the mix. Minnesota has won six division pennants during his tenure, but that’s tempered by the team’s inability to reach the AL Championship Series. To date, his post-season record is 6-21. However, it would be inaccurate for this stat to define Gardenhire; in the short-series format of divisional rounds, it’s more an indication that his top-rotation pitchers aren’t the same caliber as his opposition’s and his hitters don’t fare as well against the opposition’s top-rotation hurlers. Rather, this is more of an indication that Gardenhire’s strength is in managing an entire roster to get the most out of it, which is Exhibit A as to why the penurious Twins keep him around through thick and thin. Here’s an example that loyalty can count for something. Schoendienst may have had stints with the New York Giants (1956-57) and Milwaukee Braves (1957-60), but returned to St Louis – the organization where he started in 1945 – to complete his career as a ballplayer (1961) and ultimately stay on as a coach. When Johnny Keane abruptly resigned after the Cardinals upset the New York Yankees in the 1964 World Series – ironically to take the reins for the Bronx Bombers – Schoendienst was in the right place at the right time. He bit the bullet through two down years and then directed St Louis to two straight World Series, in 1967 – where they beat the Red Sox in seven games – and 1968, the El Birdos season so decreed by Orlando Cepeda. As a player, Schoendienst was proclaimed by Stan Musial as having “the best hands I’ve ever seen” and still holds the red-headed stepchild stat for his hitting the most doubles (8) during a three-game span in 1948. As a manager, Schoendienst kept an even keel and was known as an excellent teacher of the game. And as both, he was elected into the Baseball Hall of Fame in 1989. In all, Schoendienst wore a major league uniform for an incredible 69 seasons. Two interesting items highlighted Kelly’s time with the Twins. He oversaw their transcendence from worst to first in 1991, guiding Minnesota from their AL Central cellar finish the season before to a triumphant trip to the World Series. In so doing, the Twins repeated their formula for success in the 1987 Series by going a perfect 4-0 at home after 0-3 performances on the road. However, Kelly’s success against St Louis and Atlanta, respectively, was due to more than the din of Minneapolis’ so-called Homerdome. His judicious use of the bench and bullpen kept him in games, and his against-the-book intuition, such as allowing ace Jack Morris to go the distance in the 10-inning, 1-0 intense-fest that was Game 7 in ’91, proved to be a vital component in securing the Series. Other than that, as Kelly’s record indicates, his low-key ability to keep an even keel was probably his strongest asset. He played the cards he was dealt, and given the stingy ownership of banker Carl Pohlad, very few of them displayed royalty. In 1998, for example, with stars such as Kirby Puckett, Kent Hrbek, and Morris long gone, the Twins expunged their roster of every player but one with a salary over $1,000,000; then-ace Brad Radke was the lone survivor. Stunts like that were hard to overcome. At least, upper management understood, and Kelly persevered through eight straight losing seasons. He finally had enough of a roster to manipulate by 2001, and took the Twins to the division crown for three consecutive years. Kelly is one of only two in this group with a losing record. However, he made his team’s strong seasons count. It only took him until 1960 to guide the Pirates into the World Series, where the likes of Roberto Clemente, Bill Virdon, Vernon Law, Harvey Haddix, and Vinegar Bend Mizell anchored a squad that was outscored, 55-27, but managed to be tied at 9-9 in the bottom of the ninth inning in Game 7, when light-hitting Bill Mazeroski belted the first walk-off home run in Fall Classic history. A former Dodgers mainstay as a catcher, Scioscia is one of the few here who was a front-liner during his playing career. A first-round draft choice in 1976, he zoomed through the minors on his way to a 12-year stint in The Show, with all but two as a Bum. Considered to be one of the best defensive catchers of his era, Scioscia also excelled in his handling of pitchers. He remains the all-time Dodger leader in games behind the plate (1395) and was a key reason Los Angeles won the World Series in 1981 and 1988. Once his playing days ended, the burly backstop gained managerial experience in the Dodger system. But with Tom Lasorda ensconced as the Los Angeles skip, it was only a matter of time before he would move to another organization. Fortunately, when it happened, he didn’t even need to change his residence. Taking the helm of the Angels in 2000, Scioscia and then-GM Bill Stoneman got the team into the post-season as a wild card in 2002 and wound up winning the World Series. Soon thereafter, they crafted a run of success that saw the Halos win the AL West five times in six years (2004-04; 2006-09). Currently, Scioscia is one of ten former catchers to manage in the bigs, underscoring how well the mental skills of that position translate to calling the shots for an entire roster. A philosophical soul mate of Sabrematicians before they even existed, Weaver considered bunting a stupid waste of an out and declared his favorite strategy was a three-run homer. The Oriole offense was thus built to oblige, with bashers like Brooks and Frank Robinson along with Boog Powell combining with platoon players to put Baltimore on the board while strong defense and sharp pitching kept them in games. In fact, Weaver engineered the 1971 staff of Jim Palmer, Mike Cuellar, Dave McNally, and Pat Dobson into the only rotation with four 20-game winners this side of the 1920 White Sox. Well known for his 90-plus ejections – Ron Luciano tossed him twice before the games even started – another claim to Weaver’s fame was a rule change to counter one of his favorite moves. He’d pencil his designated hitter low in the lineup and name it as one of his starting pitchers on an off-day; that way, if the opposing starter had a rough first or second inning, the wily Weaver could pinch-hit for his DH with a batter more suited to the situation. Baseball quickly closed that loophole. Through it all, Weaver oversaw the Golden Age of modern Oriole history. The club won the World Series in 1971 and racked up five 100-win seasons. In fact, only in 1986 did he suffer a losing campaign, and that’s when he called it a career. The man who famously said he “bled Dodger blue” had a cup of coffee with Brooklyn in 1954-55 as a pitcher, but was demoted back to the minors when the big club called up a promising lefty named Sandy Koufax. Undaunted, Lasorda – who received a ring for Brooklyn’s World Series title in ’55 – tore it up in AAA Montréal, becoming their all-time winningest pitcher (107-57). However, that’s a good news-bad news stat for a minor leaguer; it means the big club has no intention, for whatever reason, to issue a promotion. It was most likely then that Lasorda realized his future in baseball – if he was to have one – would be in coaching. He succeeded in the Dodgers’ farm system and then joined the Los Angeles staff in 1973, polishing his acumen at the feet of the great Walter Alston. When he succeeded the retiring legend in 1976, the Bums never missed a beat. Los Angeles was a perennial contender, winning World Series titles in 1981 and 1988 to go with four National League and eight divisional pennants. His consistent leadership was more than enough to enshrine him in the Hall of Fame in 1997. To this day, Lasorda remains one of the best ambassadors of the game and plans on being so for eternity. He maintains that, when the time comes, he’ll request that a current Dodgers schedule be an updated part of his gravestone each year. Don’t bet against it. Easily the most decorated Dodgers skipper of all time, Alston’s one-game major league career (0-for-1 with St Louis in 1936) belied the wealth of knowledge he accumulated by – out of necessity – thoroughly learning every little detail of the game at every level just so he could remain in it. Known as the Quiet Man to the public and Smokey to insiders, Alston’s style of leadership was one of subtle confidence that smoothly transitioned to his players. This didn’t take long. Named to succeed Charlie Dressen, who had just led Brooklyn to a 105-win season in 1953 and was emboldened enough to demand a three-year deal from owner Walter O’Malley – and was promptly dropped because the Dodgers only gave one-year deals – Alston’s cupboard was full from the start. Blessed with legends such as Jackie Robinson, Roy Campanella, Pee Wee Reese, Duke Snider, Johnny Podres, Sandy Koufax, and Gil Hodges, Alston gave Brooklyn its only World Series title in 1955. His praise-in-public, admonish-in-private policy followed the team and him to Tinseltown, where his laid-back demeanor fit right in with the new environment. The Los Angeles version of the Dodgers picked off World Series championships in 1959, 1963, and 1965. They added National League pennants in 1966 and 1974. All the while, Alston operated under one-year contracts. Voted into the Hall of Fame in 1983, the Quiet Man who had let his players do the talking throughout his reign was too ill to attend his induction. In a way, it was only fitting that someone else, his grandson, made the trip to Cooperstown to deliver his speech. An early master of the new-fangled pitch known as a ‘curve ball,’ McGraw was one of the more prominent figures in baseball’s early days. A two-way player, his career on-base percentage of .466 still trails only Ted Williams (.482) and Babe Ruth (.474) in the game’s annals. However, it was his eye for opportunity and innovation that sealed his legacy. A player who saw the writing on the wall when his Baltimore Orioles were about to be ostracized from the majors for their nefarious ways – stuff like tripping runners, lying to umpires who at the time asked players and fans to help with calls, and being quick with his fists – he followed the franchise to New York City when new investors were found to run the team. From there, he then jumped to the newly-formed New York Gothams, where he would have more control over baseball operations. It should be noted that the stats listed for McGraw include his two-plus years with the Orioles. In the haze of those early days – eg- the American League’s status as ‘major’ was not universally accepted – he is still given credit for his record there. Thus, his overall managerial record is 33 seasons with a 2763-1948 win-loss total and a .586 winning percentage. McGraw is credited with introducing relief pitching to the majors, as well as promoting Dead Ball Era tactics such as squeeze plays and the hit-and-run. As his managerial career began so early, he was only 38 when he collected his 1,000th victory. In his time with New York, McGraw won three World Series championships (1905, 1921, and 1922) along with ten National League pennants. To this day, his Giants are the only team in NL history to put together four titles in a row. McGraw was voted into the Hall of Fame in 1937 by the Veteran’s Committee as a manager only. His service to the game was first recognized in 1933, when he came out of retirement to manage the National League in the initial All-Star game, held at Comiskey Park in Chicago. He lost, 4-2, but at least he wasn’t ejected and thus didn’t add to his toss total of 131. That stood as a record until Bobby Cox eclipsed it in 2007. No account exists as to how many of McGraw’s involved fisticuffs. If your given name was Cornelius McGillicuddy, you’d probably shorten it, too, as soon as you became an adult in control of your own affairs, especially if you wanted your moniker to be more easily remembered. That was Connie Mack, truly one of a kind. Nattily attired in a suit rather than a uniform and a derby or boater instead of a cap – the last manager ever to do so, as he preceded the dugout dress code – Mack was able to stay so long at the helm of the Athletics for one simple reason. Incidentally, baseball has since changed that rule also, as free-spirit owner Ted Turner quickly discovered when he attempted to do the same in 1977. He’s 0-1, or 3582 victories behind Mack. However, Turner is 3813 losses better, and his team didn’t finish last 17 times. A catcher during his playing days, Mack was one of the first to actually set up shop directly behind home plate instead of at the backstop. His ability to mimic foul-tip sounds forced baseball to change its rule so that foul tips were only outs on the third strike. Mack’s proclivity at using his glove to disrupt a batter’s swing resulted in the implementation of catcher’s interference. Mack’s managerial career began with the Pittsburgh Pirates from 1894 to 1896. Including those figures into his record, his overall totals during 53 seasons were a win-loss record of 3731-3948 for a .486 win percentage. He continued as a player only until 1901, when Commissioner Ban Johnson of the newly-formed American League asked him to head up a franchise in Philadelphia to compete with the Phillies. And compete he did. Mack’s success there enabled the Athletics to outdraw the Phils for 13 straight seasons. But his financing wasn’t as solid, so when challenges such as the upstart Federal League, World War I, or the Great Depression rolled around, Mack was forced to retrench his roster and virtually build a team from scratch all over again. Still, the good times were just that. The Athletics won nine pennants and went 5-for-8 in World Series appearances. While John McGraw juggled rosters and sought in-game strategies, Mack preferred a set lineup and played for the big inning. He was one of the first managers to shift his defense, but he rarely employed pinch-hitters and scoffed at giving signs to batters. Yet, ironically, his nickname was the Tall Tactician, most likely because, as UCLA coach John Wooden would ultimately do years later, he watched the game with a scorecard rolled up in his hand and looked like he was giving orders. Well, they did. The Athletics lost the city’s fans to the Phillies in the long run, and the American League owners – led by the Yankees – virtually demanded that the team be sold and re-located. It was, to Kansas City in 1955, and upon hearing this news, the 91-year-old Mack collapsed. He hung on until February 1956 but never got over it.